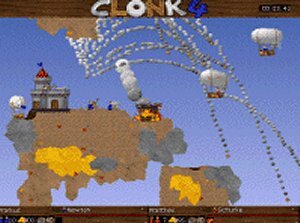 Clonk 4 was the first game in the Clonk series that took advantage of Windows 9x with DirectX and was offering high resolution graphics up to 1024x768, free scrolling in levels of unlimited size, up to four splitscreens and completely texturized landscape graphics.The game engine was extended to support freely movable objects with rotation, gravity and recoil, detailed and individual abilities of Clonks and other creatures. Many new buildings, vehicles and objects enriched the gameplay. A modular, extendable system allowed the creation of custom scenarios and objects.